This so-called “per se” limit is all the rage in law enforcement circles. It’s also not based on science. Federal traffic safety officials state that it’s hard to correlate THC levels to impairment. The FDA allows people to drive on pure THC pills (Marinol) after they get used to the drug. Frazier’s bill failed to pass the Assembly Public Safety Committee Tuesday after the majority of the committee voted "no" on it. Frazier seemed unrepentant, stating “I have eleven more years” to keep working on the bill. California NORML leader Dale Gieringer called AB 2500 “a solution in search of a problem.” Traffic fatalities have plummeted in the Golden State amid the rise of medical marijuana, statistics show. "According to data from NHTSA's Fatal Accident Recording System (FARS), the number of fatal highway accidents in California declined from 3,148 to 2,632 between 1999 and 2012." If Frazier really wants to make a difference in road safety, he should look into California’s appalling negligence with regard to alcohol-intoxicated drivers. They are far more dangerous behind the wheel, and cannot stop drinking. 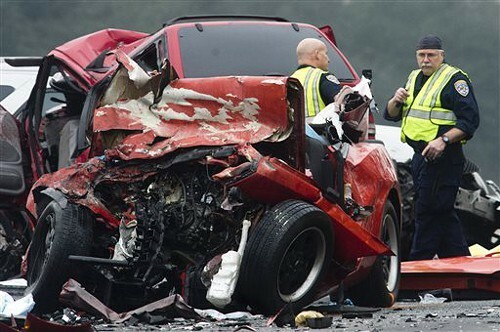 Take the case of 21 year-old Olivia Carolee Culbreath, who was allegedly drunk when she drove the wrong way on a Southern California freeway in February and killed six people. She had already been convicted of a DUI as a teen and the DMV gave her license back the week before the crash. The aftermath of drunk driving. Alcoholics go untreated in California as Sacramento politicians target sober medical cannabis patients. Part of the problem is first-time and multiple DUI offenders all get the same thing — a 30-day or 60-day education program. But: “a 2013 study by the California Department of Motor Vehicles showed no differences in DUI incidents and crashes between individuals attending and not attending DUI programs." These programs are big business, generating about $103 million in revenue. But they don’t work, because booze is addictive. "While there are effective treatments for alcoholism, education about alcohol is not treatment and doesn’t work for people with alcohol dependence. "Alcoholism is a chronic and progressive illness of the brain. People with alcohol dependence experience a strong need or craving to drink and usually can’t stop drinking even when they want to. "Requiring attendance at ineffective programs is bad public policy. It wastes resources and squanders the opportunity to help people with alcoholism acknowledge their problem behavior and try to change it using interventions that work. This not only has implications for these problem drinkers and their families, it also threatens public health and safety. Maybe that’s something Assemblymember Frazier can work on for the next eleven years.